Are you an Apothecary Healer or a Lord of Pestilence? 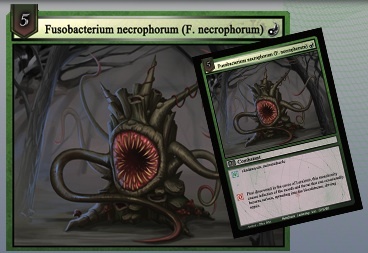 This is the question posed by Healing Blade, a table-top card battle game designed by two physicians that combines sorcery and creatures with a real-world knowledge of infectious diseases and therapeutics. Healing Blade gives you the unparalleled opportunity to enter a fantasy realm where the rules of combat deeply and accurately reflect the real world's battles against infectious disease. Reshape the Battlefield Zone to your advantage. At every turn you control the forces and special conditions that influence the outcome of each encounter. Each Champion has a unique set of gifts and abilities, and can be upgraded to powerful adversaries by way of real-world phenomena such as resistance and synergy. 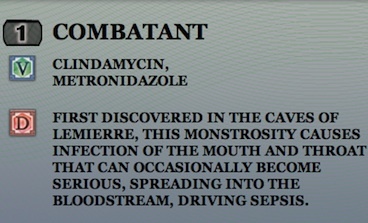 Summon forth living manifestations of diseases, or counter-attack with antibiotics in the form of powerful warriors. The game was created by Dr. Arun Mathews and Dr. Francis Kong, founders of Nerdcore Learning, a gaming company. Dr. Mathews, a hospitalist and intensivist in New Mexico, said the concept for the game came to him one night during ICU rounds. "I was struck upon the complexity and yet innate nature of gaming within the choice I would make for putting some of my sick patients on particular antibiotics," he said. "Essentially, in a similar way, when you are playing a complex multi-tiered video game, we are making similar choices by obtaining data from our cultures [and] making risk-management decisions." I don't have a science-fictional predecessor for this game, but I'm sure there is one. Healing Blade is also the realization of a personal fantasy of mine, that my son's innumerable hours playing Pokemon, Yu-Gi-Oh and other similar games might actually be turned into something useful. From AMA Association News; see also the Healing Blade.